The Yankees wrapped up an abysmal Sunday-to-Sunday period with an embarrassing Subway Series loss to what had been a struggling Mets team. By going 2-6 since last Sunday’s melt down against the Twins, the Yankees have gone into a free fall and dropped out of the AL East division race and into a wild card morass. The Yankees had no answer for Jason Bay, who went 6-6 with two HRs over the final two games of the Subway Series (Photo: AP). The Yankees were hoping C.C. Sabathia would help salvage the series and the week, but the ace lefty was in trouble from the first inning, mostly because of poor fastball command. In the second inning, a two-out, two-run hit by Alex Cora and a two-run homer by Jason Bay essentially salted the game away. While Sabathia struggled over his five innings, giving up six runs in the process, Mets’ ace lefty Johan Santana kept the Yankees bats quiet until the top of seventh inning. In that inning, Francisco Cervelli plated a run with a single that just missed hitting off the left field foul pole, but no further damage was done. The Yankees finally mounted a more sustained threat in the eighth inning, when they knocked Santana from the game with the bases loaded and two outs, but Pedro Feliciano put out that fire by getting Robinson Cano to pop out to second base. Much like in the Tampa Bay series, the Yankees roused themselves in the ninth after trailing for most of the night. The rally forced Jerry Manuel to call on closer Francisco Rodriguez one night after he recorded a five out save. With the score now 6-2, Krod entered the game with runners on a first and third and one out. The first batter he faced was Derek Jeter, who doubled home a run on a hanging curveball. Rodriquez then retired Gardneron a ground ball to third, although the call could have gone either way. Mark Teixeira extended the game by reaching on a Baltimore chop base hit, setting the stage for a classic Arod vs. Krod battle. Heading into the AB, Arod had only been 2 for 16 with nine strikeouts against Krod, but the Mets closer still pitched carefully to the Yankee slugger. After falling behind 3-1, however, Arod just missed a fastball down the middle and a changeup on the outside corner, fouling both off instead of driving them into the gap or, even better, into the seats. Then, Krod spun a curve on 3-2, but the change of speeds fooled Arod, who swung through the pitch to end the ballgame. For the Mets, the Subway Series victory not only provided two much needed victories, but also offered several positive signs for the team’s future. In Hisanori Takahashi, who pitched an excellent ballgame on Friday, the Mets may have discovered another reliable starter to complement Santana and Mike Pelfrey. On offense, Jason Bay, David Wright and Jose Reyes all contributed to the final two victories; if that trio can get hot at the same time, the Mets should be able to score their fair share of runs. 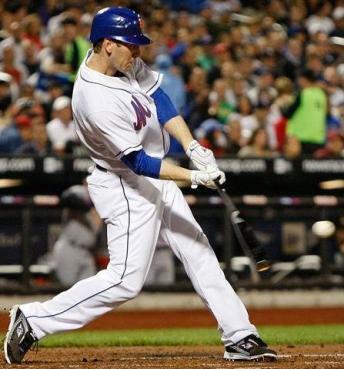 In particular, Jason Bay had a monster final two games, going 6-6 with two HRs, five runs scored and three RBIs. If Bay can really get hot, his bat could help carry the Mets over a long stretch, which would further take pressure off Wright and Reyes. Meanwhile, the Yankees leave Citi Field as the more beleaguered team in New York. In addition to being exposed because of numerous injuries, both Derek Jeter and Mark Teixeira have continued to struggle mightily, particularly with runners in scoring position. Over the last week alone, both hitters’ failures to come through in the clutch contributed at least four of the team’s six losses. In addition, the pitching staff has also been ineffective. Ironically, over the last 10 games, only Javier Vazquez has pitched consistently well (although a poor consolation, the poor performances by Hughes and Sabathia against the Mets actually give more credibility to Vazquez’ excellent outing on Friday). Undoubtedly, the Yankees have started to succumb to the pressure of being shorthanded. At 5-10 in the last 15 games, however, it is time to stop saying the Yankees have played well despite injuries. Instead, the truth is they have failed to step up despite having several big names to pick up the slack. Most of the blame goes on the players, like Jeter and Teixeira whose struggles have limited the offense, but some is also reserved for the manager. Over the Yankees’ 15 game slump, several of the losses have been abetted by very poor lineup construction and game strategy. Without a manager to help guide them through a difficult period, the players will either have to step up their performance in Minnesota, or the team will take a further step back in the division. You really know where Randy Wynn stands when Kevin Russo hits against a righty with two on and no out in the ninth inning. Wynn was supposed to be our professional, switch-hitting 4th outfielder. Cashman opted for Wynn over Reed Johnson because he wanted a guy who was not injury prone and versatile enough to play for a long stretch if someone got injured. Now we have a AAA infielder playing for him. And….your $23 MM/year star pitcher can’t get lit up in a cavernous ballpark against that lineup. I expect Randy Winn to be DFA’ed when Granderson comes back. His skills have eroded too much. C.C.’S starts was a bummer. In two match-ups against comparable aces (Verlander being the other), Sabathia hasn’t come up big. A Winn DFA barely two months into the season and the overall lack of outfield depth on a team with a $200 million payroll is a pretty serious indictment of the front office.